This butterfly matching activity is a great addition to your caterpillar theme or butterfly theme unit and lesson plans! Work on visual discrimination and introduce symmetry with these cute butterfly puzzles. This butterfly matching activity is a great way to strengthen visual perception skills. This insect and bug themed bundle includes 5 of my popular activities PLUS a bundle bonus printable for one low price. Save over 35% when you purchase the bundle. Insects & bugs theme math activities. 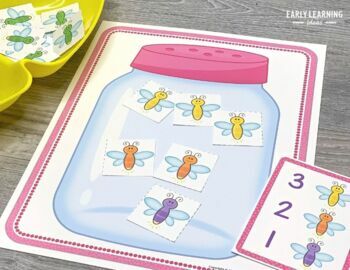 Teach color sorting, categorizing, counting, and numeracy skills with these firefly printables. Hands-on number and counting fun....perfect for your math centers in your preschool, pre-k, kindergarten, SPED, or homeschool classroom! 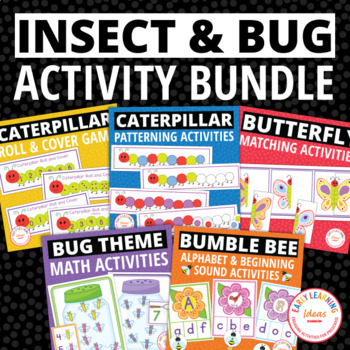 These activities are a great addition to your math centers and a great supplement to your Spring theme, Bugs theme, Insects theme, Summer theme units and lesson plans. This resource is interactive and easily differentiated. You have the ability to customize the activity to meet the needs of your students. Kids will enjoy sorting and counting the fireflies as they place them in the printable jars. Bugs & Insects hands-on alphabet fun for your preschool, pre-k, early childhood, special education, and kindergarten classrooms. 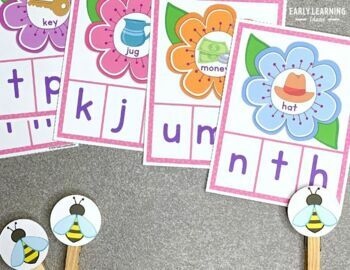 Use this bumble bee alphabet clip cards to teach letters, letter identification and uppercase and lowercase letter matching, and letter sounds. You will need at least 1 clothespin clip to complete the activity. Kids will love attaching the bumble bee clip to the correct letter on the bottom of each clip card. Children will have the opportunity to work on letter recognition as they match select the matching uppercase and lowercase letters. They can work on letter sounds and beginning sounds with two levels of beginning sound clip cards....one version has word labels, one does not. Caterpillar pattern activity boards are a great addition to your caterpillar theme, butterfly theme or Spring theme unit or lesson plans. The interactive caterpillar themed activity is fun for individual or small group activities in preschool, pre-k, tot school, kindergarten, prep, and early childhood education. This is a great hands-on patterning activity for you math center, math work stations, or math tubs. Within each type of pattern you will find 3 boards with caterpillars that are completely colored in and three boards with caterpillars that have some blank sections. Younger children will enjoy using the full color boards for color matching while older children can use the boards with blank sections to practice identifying and continuing the patterns. Blank boards were added so that kids can make their own patterns. Please check out the preview file to see samples of the pattern boards. 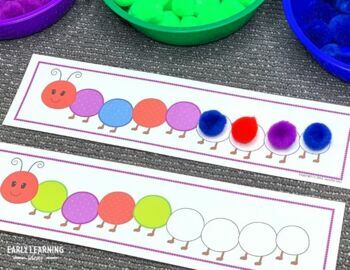 Pom-poms, buttons, magnetic counting discs, or other manipulatives can be used to cover the patterned segments on the caterpillar bodies. If you do not have pom-poms or other items in the correct colors to use to cover the caterpillar sections, I have also included a page of color discs that can be used with the activity. The pattern board activity is fun to use on a magnetic board or cookie sheet. Simply apply magnets to pom-poms with a hot glue gun. This butterfly matching activity is a great addition to your caterpillar theme or butterfly theme unit and lesson plans! Work on visual discrimination and introduce symmetry with these cute butterfly puzzles. This butterfly matching activity is a great way to strengthen visual perception skills. The development of visual perception skills will help children with number, letter, and word recognition. Children can find the matching butterfly wing cards and place them on the boards. Please see the preview file for a sample pages from the activity. This activity is appropriate for your preschool, pre-k, homeschool, early intervention, special education, occupational therapy, or speech therapy classrooms. It is a perfect activity for your math center. It can be used on a magnetic board, cookie sheet, as a file folder game, or in a busy bag. This caterpillar math game is a perfect addition to your caterpillar, butterfly or children's book study. Easily Differentiated! ✔ one less game board. Double-sided game boards can be easily created. To play the game you will need a standard die, and something to cover the caterpillar sections. ✔ one more and one less. To play, kids simply roll the die and cover the corresponding caterpillar segment. You can easily play with different game boards and different levels of learners at the same time.